Thought I start this off with KI being featured in an US travel trade magazine. Although I spotted my first male Kangaroo Island kangaroo through binoculars, the muscle-bound fellow was still an impressive physical specimen, sporting a bodybuilder's chest and arms that certainly seemed capable of knocking out any heavyweight boxing champ. An endemic subspecies, Kangaroo Island kangaroos evolved differently from their mainland cousins after the island separated from the rest of Australia about 10,000 years ago. "Our kangaroos are very distinctive," said Craig Wickham, the owner of Exceptional Kangaroo Island, a high-end tour provider. "You'd pick them out of the lineup of other kangaroos in Australia mainly because they're quite a distinctive color. They're more of a chocolate brown, and all their points — their muzzle, their paws, their tail, their ears — are black." Wickham said it's also common to see stocky, muscular males, who can be as tall as 4-and-a-half feet. "The heaviest kangaroo ever weighed was a big male Kangaroo Island kangaroo," he told me. "So they're heavier than even the big reds [on the mainland]." Around dusk on the same day, I stood only 15 feet from a much less brawny, wild female kangaroo and her joey in a grassy field near the island's southwestern coast. Glancing up only occasionally, and largely disinterested in me, the fuzzy duo foraged over the green terrain along with dozens of other kangaroos as the closing colors of the day faded along a tree-lined horizon. A nightly, predinner activity for guests staying at the luxurious Southern Ocean Lodge, the Kangas and Canapes outing offers folks a chance to mingle with the iconic island wildlife while sipping a glass of Champagne. "Kangaroos are not entirely nocturnal, so they'll start to appear around 4 to 4:30 in the afternoon," said Alison Heath, the lodge manager for the Southern Ocean Lodge. "I think the animals themselves are kind of used to us now, so they typically let us get fairly close." A South Australia native, Heath said Kangaroo Island's wildlife still astonishes her. "It's untamed," she said of the island, a third of which is protected national parkland. "It's not as if you're going to visit a zoo. The animals are indeed wild animals, and they behave that way, and you might just randomly come across an echidna or koala sitting in the road." During my recent visit, hosted by Tourism Australia, I did indeed catch a glimpse of a spiky echidna, an egg-laying mammal that looks a little like a porcupine with a longer nose, hurrying down the side of a dirt road. And I also saw several wild koalas, most snoozing in the branches of their favorite dining establishments: bluegum eucalyptus trees. Spotting the furry Australian icons happened, however, largely thanks to the expert eyes of my Exceptional Kangaroo Island guides. "Craig Wickham is an ex-park ranger, and he knows the island backward," said Ian Swain, owner of the Philadelphia-based packager Swain Destinations. "He also knows nearly every kangaroo and koala there," he added with a laugh. "And he certainly knows where to find them and give clients an incredible experience." Swain Destinations frequently books U.S. travelers on Australian itineraries that include stays at Kangaroo Island, which is located just 10 miles from the mainland and only a 30-minute flight from Adelaide. Clients are encouraged to stay three nights — four is better for those with time, Swain said — and at least one completely customizable and entirely commissionable outing is suggested with Exceptional Kangaroo Island, whose guides work hard to get folks near the animals. Close proximity was the highlight of our later trip to the island's Seal Beach, where I walked within just a few feet of several adorable sea lion pups and enjoyed a front-row seat for a sandy territorial scrap between juvenile males. According to Wickham, visitors to Kangaroo Island have been spending time near the sea lions there for 75 years. "Over time, there was a level of habituation with the animals that occurred without feeding them," he said. "They just accepted us as being part of the landscape." Home to less than 5,000 residents and only 1,700 square miles in size, Kangaroo Island's major attraction is no doubt its distinctive collection of wildlife, which also includes more than 260 bird species, but visitors booked at the Southern Ocean Lodge are in for a treat. Surrounded by national park, the cliff-top eco-hotel offers tremendous ocean views and a collection of 21 beautiful suites in a friendly, informal atmosphere. The lobby bar, for example, is an entirely help-yourself affair. "Southern Ocean Lodge is one of my favorite lodges in the world," Swain said. And the property's terrific restaurant makes use of an impressively diverse collection of locally sourced farm produce and products, including fish raised by students at a local school. "They actually farm barramundi," Heath said. "The little kids feed the fish, and the big kids sell it to us." Hopefully short features like this will encourage US travel agents to consider Kangaroo Island, South Australia and Adelaide as a destination to their customers. Also a small step on the path of attracting an US-based carrier to Adelaide. I work for a U.S. firm and many of my US colleagues and friends of their friends have visited SA especially to visit KI. There's more international visitors than you'd think. An airport similar to the one in Proserpine in the Whitsudays that can handle B737s and A320s. Now that would be something! Won't go off topic too much though and will only post articles about SA as a destination, but thanks for your observation Wayno. 10 top pubs (Regional SA, Adelaide Hills) that "serve food too good to be called pub grub"
Good ideas for tourists and locals venturing beyond the CBD/suburbs, especially as summer holidays approach. Places to consider for meals, with a dose of scenery, ambience, for yourself and or visitors on short/longer trips to the regions, including Kangaroo Island, or Hills just beyond the 'burbs. A broad mix of style/settings, cuisine and geographic locations in this article. Is your favourite in the mix? Do you have a favourite or another to add to the list of 10? The article (10 Unexpected Places to Travel This Summer) published on Friday 26 May 2017, lists South Australia as the top third destination out of ten places around the world to travel to in summer. To compile the list, Vogue reached out to their resident travel experts to share their ‘favourite and unexpected summer vacation destinations’ with South Australia the list’s only Australian destination. South Australia is featured among nine other international cities and countries, including Sifnos (Greece), Faroe Islands (North Atlantic Ocean), Portugal, Aland Islands (Finland), Copenhagen (Denmark), Tofino (British Columbia), Namibia, Komodo Islands (Indonesia) and Baja California (Mexico). The article’s author, Leiti Hsu, notes the impressive food and wine offering in South Australia as well as the regions’ proximity to Adelaide as a key driver of the listing with SA described as the ‘foodie state’ of Australia. “Just an hour-drive away is the Barossa Valley, which makes some of the country’s finest wines from some of the world’s oldest vines. Right in town is the original Penfolds Magill Estate, and 20 minutes outside of town is the Basket Range wine region, which is leading the country’s natural winemaking movement,” says Leiti. With uninterrupted coastline and crowd-free beaches, world-class restaurants showcasing South Australia’s fresh produce and seemingly limitless wine experiences, it’s no surprise South Australia is listed as the place-to-be this summer. Vogue’s summer travel list helps bolster South Australia’s reputation as a not-to-be-missed destination and firmly cements South Australia’s position as a world-class food and wine haven. South Australia is also proud to feature in Lonely Planet’s Top 10 Regions to Visit in 2017 list, to be the No.1 Place to Be in 2017 by emerging travel website Trip.com and ranked the world’s 5th most Liveable City by the Economist Intelligence. Have you never just walked into a travel agent and said "I would like one holiday please"? This is a positive coverage which would increase the exposure of this city to the world. We need more interesting write-ups like this to increase tourism and to boost our local economy from this sector. The more we market the place, the higher the percentage of tourism would be which is a necessity for a city that is not a main tourist attraction. Adelaide and SA features in this story on Lonely Planet. Lonely Planet Local Charles Rawlings-Way moved to Adelaide a decade ago, thinking he’d give it a year to see how things panned out. Within six months this sunny southern city had its hooks into him, exploding the myth of the ‘City of Churches’ moniker and exposing its arty underbelly of bars, pubs, festivals and wine-soaked surrounds. We get a mention in Fairfax Media's Traveller. 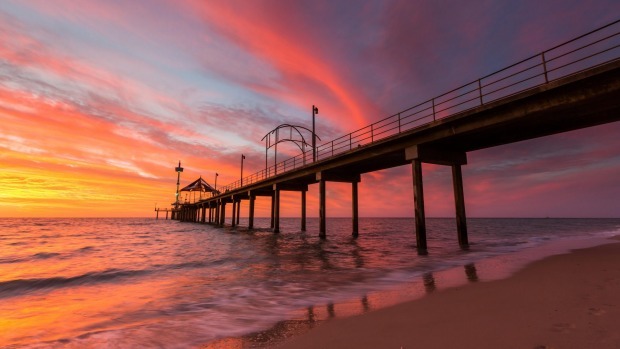 And... to boot the article leads off with an image of the Brighton jetty. Unlike Brisvegas, Radelaide actually lives up to its sarcastic nickname. Adelaide is rad. It's filled with extremely good restaurants, far more than a city of 1 million people really deserves. It's within striking distance of three top-class wine regions. It has world-famous arts festivals. The pub and bar scene is great. And yet Adelaide is tucked away out of sight and out of mind, and is never mentioned in the same breath as Australia's eastern capitals. I am starting to feel a change in Adelaides name and standing has started to improve. I feel like the city has been able to shrug off some of the negativity, especially amongst locals. I don't think changing demographics has anything to do with it. Over the last few years at least imho, we've seen a lot more positive coverage of Adelaide interstate in national publications and what not. Adelaide getting a mention as a top destination in global travel publications has also helped. I think maybe more Australian's are traveling around Australia then before. You know, beyond Sydney Harbor and the Gold Coast. And seeing that the rest of the country isn't that bad after all. The new 130~m buildings going up, and hopefully in the next few years a few taller, should they have a big positive impact on the skyline and view of Adelaide from the typical prominent spots we see shots of Adelaide from, then I think that too will help boost the image of Adelaide. Certainly I think that it self will help boost morale locally. Adelaide gets a nice mention in Skift, a travel industry intelligence platform. A combination of small-city hospitality, modern facilities, a collaborative approach, and an effort to show off individuality is winning over event organizers who tend to select big cities for their conferences. The Australian city of Adelaide is still patting itself on the back over the success of the week-long 2017 International Astronautical Congress which drew 4,500 delegates. While there was nothing quite on that scale in 2018, the city did host 2,300 travel industry professionals at the Australian Tourism Exchange and another 750 at a Joymain incentive group event, and planning is underway for the 3,000-delegate World Routes Conference to be held for the first time in Australasia next year. Adelaide takes a very personal approach to event bids, with its civic leadership playing an important role in helping sell the city. According to a member of the marketing team, the ease of access to meet with The Lord Mayor and government officials is particularly appealing to the Chinese incentive market and it gives Adelaide a unique edge over many of the larger competing destinations. The current mayor, Sandy Vershoor, said her city is “the perfect city to host meetings and events”. “The City of Adelaide is such a beautiful place, easy to get around, and our facilities such as the newly developed Adelaide Convention Centre are ideal for meetings and events. 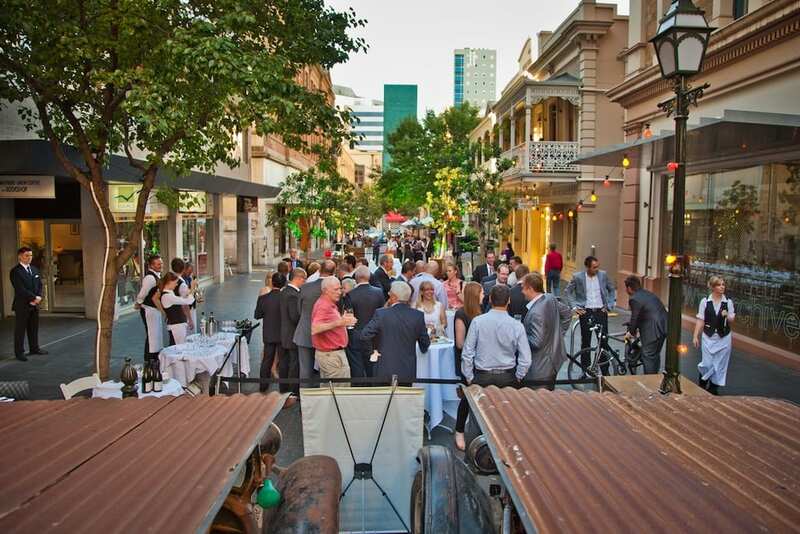 At the end of the day, meeting attendees can stroll out to find world-class eateries in the CBD and North Adelaide. If staying on for the weekend, they can visit Adelaide Oval, North Adelaide Golf Course, shop in Rundle Mall or take in a show at the Festival Centre”. Like Manchester and Gothenburg, Adelaide presents itself to the meetings industry as a smaller city – with big city infrastructure. “The collaboration and opportunities to promote Adelaide that we enjoy through our partnerships with the City of Adelaide, the State Government and the entire Team Adelaide is most certainly one of the biggest assets we have in attracting events to Adelaide,” said Damien Kitto, CEO of the Adelaide Convention Bureau. “Not only does access to this caliber of local decision-makers for event owners always impress, but to also be able to assist organizers with the likes of closing down a city street or gaining access to the gardens of Government House or private room within the Town Hall for functions are invaluable tools that this group may effect”. Matt Grant, associate director of economic development & tourism in the city administration, understands the importance of the visitor experience, whether it’s for business or holiday. The full article including write ups on Manchester, UK and Gothenburg, Sweden can be found at: Smaller Cities Win Bigger Events By Trying Harder.